How to keep from tripping over the same stone twice? As COMUCAP grew in number of members and economically they acquired investments for processing coffee, aloe and juices; they exported coffee and sold soap, shampoo and juice; they bought land and planted it;M and many projects came in. Nevertheless in 2012 they learned that their organization of 283 women members was about to fall off a cliff. What had happened? What had pushed them to the edge? How could they move away from that cliff? In this article we try to respond to these questions, precisely to “not trip over the same stone twice.” Behind the animation of the roaring lion there is a movie that has not yet been seen. Let´s look at it. An independent audit revealed that the debt of COMUCAP was close to one million dollars, that the assets of the organization had a lien on them due to the debt, that a piece of property bought for $150,000 had not been turned over to the organization, and that it was not clear where resources from international aid had gone. This information raised the eyebrows of the members in the 2012 assembly. Other data followed: 100% of the coffee exported was organic and fair trade, in the last 3 cycles prior to 2012 they had exported close to 10,000 qq of export coffee; a good part of that coffee was bought off of individuals who were not members, close to 1,000 qq of coffee was from the coordinator of COMUCAP herself, whose quality surprisingly scored at 85, while the coffee of the members was equal to or less than 81; the yields (from 1 qq of cherry coffee to export coffee) were dropping; the premiums for organic and fair trade were confused with project financed by international aid, making it impossible for the members to see that they had not received neither premiums. The crisis was even more harsh because it coincided with the arrival of the coffee rust on the plants, that not only lowered their production yields, but in many cases anthracnose came behind the rust leaving the coffee fields with dead trees. The coffee rust and the “human rust” had bashed the organization of the 256 members. Obviously all those losses and debts had to be assumed by the members. All this is like the animation of the roaring lion, because this type of movie is repeated in many parts of Latin America. Nevertheless, as the philosopher Heraclitus said, though we bathe in the same river, we never do it in the same water; the next section responds to the question about what things pushed COMUCAP to the edge of the precipice. Let´s sit down to watch this film. Why was COMUCAP on the “brink of a cliff” –debts, poor administrative management and a hold on their assets? The members and aid organizations listened to information in the annual assemblies, but it was information that was not telling them what was really happening. The staff was subordinated to the family that coordinated COMUCAP and the board of directors relegated to being “only for show”, to sign checks; even a leader turned into an employee for two years signed checks as if she were the president. In other words, they would produce information in a disloyal way for the organization and in a way subordinated to the coordinating family. Why did they not have access to the real information. A good part of the 256 women had been trained for 10, 15 and 20 years in negotiating their rights, managing funds for groups, political advocacy and values like transparency and equality. Why then did they not demand the real information? “Because we fell asleep”, said one of the historic leaders: they stood by. Ther trust in the coordinator was blind and total, because since 1993 she had trained them in women´s rights, and used to tell them that “she worked for the women”, she was from a family with resources and they nearly worshipped her: “having what she needs to live and she works for us” they would say with gratitude, feeling themselves blessed. One member could not be mistrustful when the reports would be presented before the international aid organizations, who would repeat “everything is in order”. One member could not prove that she did not receive the organic nor fair trade premiums for her coffee when the fair trade and organic certification audits would conclude “that everything was in order.” If everything was in order, it was logical to conclude that the information that they were being presented was correct, and it was obvious that if a member dissented, she was running the risk of not being a beneficiary of the next project. It was like feeling like an ant under a transnational elephant that grew and grew. Why did they leave the decisions in the hands of the administration? Because the millennium institution of “we always need a patron” absorbed them. The women had been trained to defend their rights in their homes and to seek equality with their husbands. And this they were doing, supported by an office of COMUCAP itself. Nevertheless, they did not expect that “the patron” would appear in the “new guise”: who would subordinate the staff with loans and salaries, control the members on the basis of projects, and the leaders through travel allowances, and ran COMUCAP as something independent from the members. Like a large estate owner who believes that the land and everything on it is his, or like the holder of an encomienda in the colonial period that would receive land “including the indians that lived on it”, she would repeat to them: “without me COMUCAP would not exist, everything that is here is because of me” – meaning that everything was hers. Why did the old “patron-client” institution absorb them? Because even though the women woke up about their rights and the importance of generating their income to sustain that awareness, COMUCAP was an external product with members dispersed in several municipalities, started on the basis of external resources and not on the basis of the contributions of the members; and because they did not learn to lead the organization through its organs (assembly, board, oversight board), and in accordance with its rules (statutes), because “we felt it was far away, someone else´s”. That is why they would hold an assembly once a year, as if an organization would have so few decisions that merited meeting only once a year; the board members were content to sign checks and travel every now and then; the groups never met with their boards; a member who needed something from COMUCAP would not propose it in the group meeting, nor to her group board, she thought it was not her right but a favor, which is why she would go directly to the “big honcho.” This lack of ownership and effectiviness in leading the organization left COMUCAP in conditions where the proverb “in an open treasure even the just sin” became a reality. COMUCAP had become a “factory” where a member would become a beneficiary, a leader subordinated, and a coordinator with a social vocation would become the big honcho (patron). Here is the root of the problem – “the motor” as Aristotle would say. The member assembly in 2012 heard the results of the audit. There was a mixture of everything: silence, murmurs, rage, impotence, feeling of having been betrayed…Some returned to their homes, and recalling the sacrifices that they had made for so many years, cried wanting to hear an echo in the universe. Others moved to defend the offices and the coffee and aloe business of COMUCAP, because the coordinator, her family and allies did not even want to turn over the assets with liens on them. They spent 3 years in hard legal battles, negotiating with the banks, getting the aid agencies and the buyers to see the obvious facts of what was happening, getting the members to trust again, looking for money to buy coffee, looking for markets for their coffee, their aloe, their shampo and juices. What really caused the beginning of the change in COMUCAP? Each year an audit would be done, fair trade and the organic certifiers also did audits. There were more than 17 bank accounts because the aid agencies wanted their money to be administered separately. The results indicated that none of that ensured good administration. 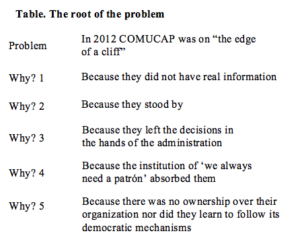 It is very possible that without the support of two people who worked in 2 aid agencies, who detected the problem, recommended an independent audit, and accompanied the board for some time, and without the awakening of the new board, COMUCAP would now have fallen off the cliff or been completely privatized by the coordinator and her family. Crisis happens when what should die, does not, and what should be born, does not. After 5 years COMUCAP has been able to grab ahold of some “rock” and not fall off the cliff, in contrast to the prophesy of those who opposed it. Nor has it moved away from that “cliff”, the risk that it might trip over the same “stone”, described in section 2, and fall even harder off the cliff is real. In other words, that which should die still has not died. How can it move away from the cliff, or build a bridge to cross it? For what needs to be born to happen, we suggest three steps (see attached Figure) under the sequential order that follows: awareness and vision of the members as a reference point, looking inward where their roots are, and looking outward to be accompanied. First step, start from the awareness and vision of the women members. Awareness: “everything that exist is there because we sweated with our fellow members with the sacks of fertilizer planting coffee, aloe, cooking, leaving the family on their own.”; as Jesus would say, if they keep quiet, the stones from the aloe and coffee business and the orange and coffee farms, WOULD CRY OUT. The original vision of dozens of women: COMUCAP started to sell the products of its members and accordingly built equity in their homes and communities. To sell whose products? The products of ITS members! Second step, finding a solution to the root of the problem, ownership and operating within the democratic mechanisms of COMUCAP. There is their new “motor”. Their “break even point” is not buying coffee from whoever and however, it is not adding new members as best as possible. It is going back and building trust in each family, each group, the board of each group, the asembly, the board of directors, the oversight board and the staff that they have. COMUCAP now has 505 members. Let us recall popular wisdom, the stronger the daughters and sons are, the stronger their parents will be – in other words, the stronger the families are, the stronger the groups will be, the stronger the groups are, the stronger their board and their staff will be, and COMUCAP will be stronger. Third step, weave alliances with people (and organizations) like those who helped them to begin the change in 2012 and who left them the secret for getting ahead: study the reality itself, wake up to what the study finds, and be accompanied in the process of change. For these three steps the notion of stewardship helps us: our lives are a breath in the life of the universe, our participation in an organization like COMUCAP is at the most a tenth of a human life: a leader who lives for 90 years will hold posts for less than 9 years, a salaried worker will not be there for much more than that. In other words, while we hold positions of responsibility we must give the most of ourselves serving the 505 women, many of whom are single mothers taking care of their grandchildren, assuming the roles of mother and father. Stewardship, according to Block (2013, Stewardship: Choosing Service Over Self-Interest), is “the willingness to be responsible for the wellbeing of the organization, working in service of those who surrond us, instead of controlling them. It is responsibility without control nor compliance”. Can the 505 women and the organizations that consider themselves to be their allies let die what needs to die, and give birth to what need to be born? The lionesses of Marcala are roaring: this movie has barely begun. En este articulo nos inspira el espirito de cambio con tan solo hecho de aportar ideas,esas aguas que movieron en este país hermano también esa aguas podemos moverlas cada uno de nosotros desde nuestras organizaciones,comunidad,familias. Como el oro que miro la profesora ver rodar por el suelo y que nadie lo estaba recogiendo,ese oro brillo y no dice cuanto fue la inversión solo cuenta cuanto fue el cambio que provoco.gracias a la colaboración del investigador Rene Mendoza,podemos conocer otros lugares del mundo sin viajar con tan solo hecho de leer.